TenguLife: The curious guide to Japan: Kaizen - the most Japanese of concepts - or was it...? Kaizen - the most Japanese of concepts - or was it...? 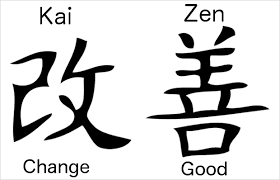 Kaizen, or as it is more commonly known in English, "continuous improvement" (though the kanji characters would more appropriately be translated as "change for the better") is virtually synonymous with Japanese manufacturing techniques. It encapsulates continually enacting micro adjustments to a process to bring about long term improvement in quality and efficiencies of practice. Toyota is the World Heavyweight Champion when it comes to driving Kaizen not only through production but also the entire supply chain as well as the complete corporate hierarchy. As early as the 1980s, Japan had thrown off the image of being the home to cheap, though somewhat shoddy, goods. Whether children's toys or automobiles, Japan became recognised as the unstoppable machine, exporting reasonably priced, high quality products and the low quality baton was passed to China. The process of kaizen was seen as a panacea for industry and began to be replicated around the world. Japan was indeed seen as a visionary market that had created a winning formula. Well yes, and no. Japan did indeed execute kaizen brilliantly, initially in manufacturing followed by supply chain (think "Just-in-Time") and then extended into services. But it didn't actually invent the concept so closely associated with its own success. It was actually America that imported the idea post-war as Japan sought to rapidly reconstruct it's shattered economy. Building on the earlier work of Walter Shewhart, an engineer and statistician, The Economic and Scientific Section of the Occupation Forces actually implemented kaizen so successfully into Japanese industry. And in 1960, the Emperor even gave them a medal for it. Blue signs and hubcaps - the speed cameras of Japan. You can even QR TenguLife! Text Copyright of TenguLife unless otherwise indicated. Simple theme. Powered by Blogger.